HomeHome /	/ Blog / Smoky Mountains / It’s the Smoky Mountains – Let’s Get Married! Did you pop the question yesterday? Lots of people propose to their future spouse on Valentine’s Day, posing the most romantic question on the most romantic day. And many of them come to Gatlinburg and the surrounding area to get married. 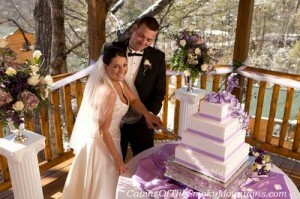 Gatlinburg is the 3rd most popular place in the world to get married. The State of Tennessee makes it an uncomplicated process with simple license requirements and no waiting time or blood tests required. The Smoky Mountains provides the gorgeous, hugely romantic backdrop, while wedding chapels and honeymoon services proliferate here with an unrestrained romantic touch to make lifetime memories for newlyweds. Romance and the Smoky Mountains go together like, well, like husband and wife, as it turns out. Couples come for romantic getaways, and stay or return to get married, then stay for their honeymoon, and come back again and again, to celebrate their anniversaries and to renew their marriage vows. This Smoky Mountains area is so beautiful and accommodating that you can get married practically anywhere you want and make the event perfect. Get married in your own luxury cabin, and just stay over for the honeymoon. Go for simple seclusion, or make a greater splash, the choices are abundant. Get married on the ever-popular Grand Staircase of the Titanic – and all this February mingle with long-time lovers returning to renew their vows. Get married 400 feet in the air, carried aloft with 30 guests by a huge helium balloon, savoring panoramic mountain views never to be forgotten. Or stay on the ground a little closer to nature surrounded by trees on a spacious Smoky Mountain deck wrapped around a cabin or wedding facility, like our own Cabins of the Smoky Mountains wedding facility in the Pigeon Forge vicinity. It’s close to many of our romantic getaway and honeymoon cabins (which usually include free access to the wedding facility). And you can add one of our special packages for Gatlinburg weddings and let our wedding planners take care of everything. Here in the Smoky Mountains, wedding packages and accommodations of every kind abound, which is fortunate because making all these arrangements is the last thing you want to do. You just want to get married. And we were all just waiting for you to pop the question. So, did you? ps…Whether you’re looking for a one-bedroom cabin or a cluster close together – or even one of the monster 18-bedroom(!) cabins to host your guests and family, we can suit your needs with over 400 choices of Gatlinburg cabins, Pigeon Forge cabin rentals or Wears Valley cabins. And call us anytime at 855-91-SMOKY.